MGM/Everett Collection Gone With the Wind, from left: Clark Gable, Vivien Leigh, 1939. Stars: Clark Gable, Vivien Leigh, Leslie Howard, Olivia de Havilland, Hattie McDaniel, Butterfly McQueen. Academy Awards: 10 Best film, director (Fleming); lead actor (Gable); lead actress (Leigh); supporting actress (McDaniel); cinematography (Ernest Haller, Ray Rennahan), editing (Hal C. Kern, James E. Newcom); set direction (Lyle Wheeler). It won two other technical non-category awards. 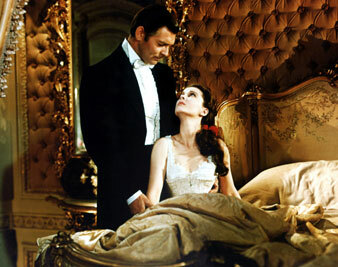 Rhett Butler may not have given a damn, but audiences did. The film of Margaret Mitchell’s bestselling saga of the ante- and post-bellum South set box office records that still stand. While it garnered ten Academy Award nominations, not everyone was convinced of its greatness. The Nation‘s Franz Hoellering was one of the doubters. As you may have heard, Gone with the Wind, the $3,900,000 super-picture in technicolor–playing time: three hours and thirty-seven minutes–has arrived. During years of preparation and twelve months of actual shooting, hundreds of people under David O. Selznick’s supervision were at work to produce the epoch-making picture of our time. The result is a film which is a major event in the history of the industry but only a minor achievement in motion-picture art. There are moments when the two categories meet on good terms, but the long stretches between are filled with mere spectacular efficiency. One admires an excellent cast and a hundred technical details, but one’s heart seldom beats faster. While one waits to be carried away, critical thoughts have time to develop. The feeling grows that one is sitting in a Hollywood Duesenberg with nowhere to go. The picture consists of two parts punctuated by a brief intermission. The first starts with the Civil War and ends with its close; Scarlett O’Hara is back in Tara. The second is essentially the story of her marriage with Rhett Butler. In the first part the Civil War is the driving force, not the characters. In the second the characters dominate. The hospital scenes and the evacuation and burning of Atlanta are dramas in themselves, and their cinematographic reproduction is unforgettable; at the same time they reveal the principal weakness of the picture as a whole: the characters alone do not suffice. This would be no fault if not they but the times were the focus. As it is, a Strindbergian theme is attacked without Strindberg’s power, hate, and insight. In spite of many excellent scenes the drama is not convincing. With the camera turning from high spot to high spot the psychological development is neglected. One understands less and less why things happen and thinks easily of more plausible alternatives. This also explains why in the end Rhett Butler’s “I don’t give a damn” comes as a surprise and shock to the audience. These are critical remarks dictated by absolute standards. Relatively the picture represents progress in many respects. The courage of its producer deserves sincere acknowledgment. He proves that films of more than three hours’ playing time are possible, opening the way to movie epics. He sets a new technical standard: the era of the sixties is reproduced in architecture, costumes, and make-up as never before. The technicolor photography is so superb that the normal preference for black-and-white pictures is forgotten. And the cast, in the main scenes as in the episodes, is excellent. Vivien Leigh in appearance and movements is perfect as Scarlett. Her acting is best when she is allowed to accentuate the contrasts of the split personality she portrays. Why she loves Ashley Wilkes (Leslie Howard, who is convincing in his specialty as noble sap) remains a riddle, but that is not the actress’s fault. She is particularly effective in such moments of characterization as in the morning after Rhett has carried her up to her room against her will. Clark Gable as Rhett Butler is best in the second part, where he can show the heart of the tough guy though he cannot bridge the gap between his love and his final disgust–but again, it is not his fault. Of the other characters I have only space to mention Hattie McDaniel as Mammy and Butterfly McQueen as Prissy. Victor Fleming’s direction is expert and always tasteful with one exception: when he lets Scarlett stand like the Statue of Liberty on the barren fields of Tara after she has vomited (a scene which is hidden in shadows). Of course one can easily conceive of a less polished and more exciting production of “Gone with the Wind”–for example, as an independent Eric von Stroheim would have done it. On the other hand, the fact that the hero and heroine of a super-picture are no longer merely noble and glamorous indicates a development which deserves high praise. The Light That Failed (Paramount) is an ambitious movie version of Kipling’s famous story. It is unevenly told, but Ida Lupino, as the girl who destroys her own portrait, makes the picture worth seeing.